Hey there, future CEO! Glad to see you here and thank you for your continued support and patience. We have been working around the clock the past few days making a lot of progress in terms of stability and playability, but have also had the time to expand the game with further functionality. We’ll address all these topics, but soon we’d just like to once again thank you for all the great comments and feedback on the latest video. We were supposed to release this yesterday but (un)fortunately we have the habit of getting carried away by coding and simply forget that it is Monday. Olof is currently on a trip to Iceland over the week but when he’s back we’ll make sure to record the second part of the gameplay series, we’ve got so much content and gameplay to show you! We’ve implemented a number of measures to continuously generate jobs in ACEO. As you might know, every hire in your airport is an individually simulated agent with their own person data, personality and traits. Each job in ACEO is also individually simulated, meaning that when you plop down a security station, four jobs are created and thus will be picked up and taken care of by your hired security personell. These jobs were previously static, but now have a defined length that you can set yourself. For example, an information desk job can last two hours and when those two hours are up the jobs are regenerated. If you have more airport staff employed, it is likely that this will be picked up by them, if not then those same staffers will take care of it again. While this yet have no effect, we could easily in the future simulate employee fatigue and then correlate it to how well they perform their job. This could be especially efficient when working in security, as you have a trade-off between resource utilization and quality of work. We’ll adress this more in the upcoming video. 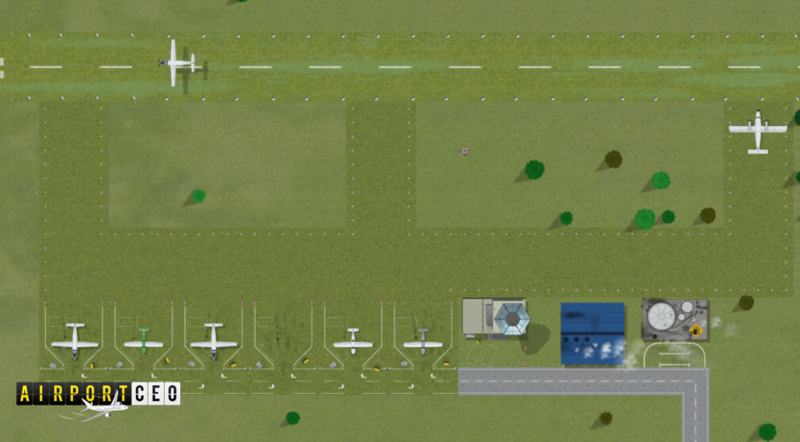 We are focusing a lot on the long term playability, we don’t want the player to build an international airport within minutes and then feel like they have beaten the game. In career mode we want you to start with a very basic airfield and eventually transform it into a grand international airport. So adding general aviation now is good for getting the initial revenue via landing and parking fees. Testing wise it is also a great way for us to test the aircraft cycle de-coupled from the passenger cycle. Of course, when your airport grows you might find that the small Cessnas will only create traffic conjunction and you can choose to reject GA flights. 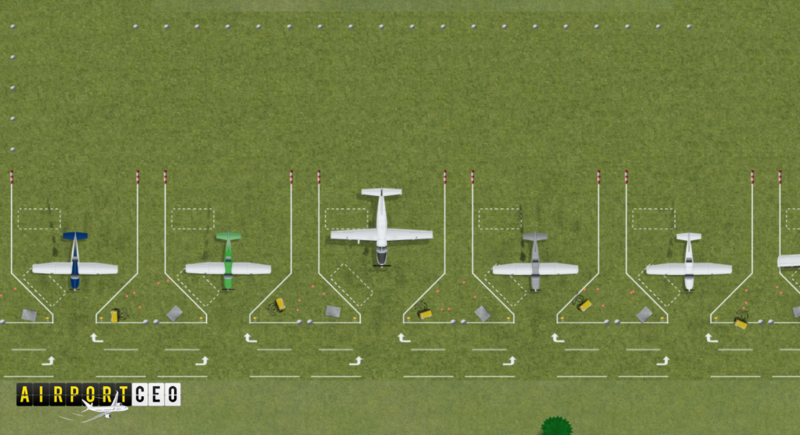 A small airfield only designed for general aviation. Rows of Cessnas in different sizes. The biggest focus of the development right now is to sew the ends together. We are working very much with different types of testing and have overhauled aspects of passenger behavior, essentially we’ve built a fail-safe system so that they correctly can handle unexpected turn of events (such as the deletion of an object they interact with) and don’t get stuck. We’ve also done a lot of work on the aircraft path finding and handling system and have run rigorous tests here as well, simulating several days of continuous flight arrival and departure with hundreds of flights so that we can make sure no deadlock or path breaking issues can occur. The big challenge here is that the system must be able to handle situations that are very difficult and maybe impossible to predict, because it is highly dependent on how the play chooses to design the airport. Of course if you limit the freedom of design, the easier it will be to predict behavior, so this is a balance we must find. All right, that’s it for this week. In other news, we’ll be looking to onboard a moderator as the forum is already seeing a lot of action that we have a hard time managing, and most likely will see even more as we steam towards a release (can’t wait to open up that bug section…). See you during the week, we always try to answer all the messages we get but sometimes we forget. Thanks! See ya soon!